Fresh & Saltwater Aquarium Supplies. 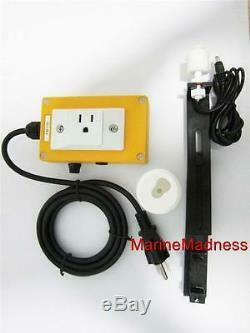 CORALVUE ELECTRONIC FLOAT SWITCH 110 FOR FRESH WATER TOP OFF SYSTEM AQUARIUM. What is a electronic float switch and why do you need one? It is a device that will automatically top off you aquarium with fresh water and will automatically cut off the pump once the desired water level has been reached. In other words, it will make your life a whole lot easier. As we all know, water evaporates from our aquariums daily. When this happens most of us manually top off our tanks with fresh water (RODI water) to keep the salinity constant. This can be very frustrating! With Coralvue's electronic float switch with you can set up a fresh water container bin, small tank etc.. with a pump inside (not included). 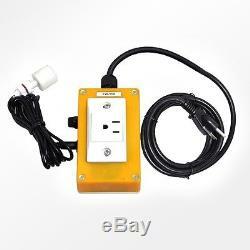 You will then set the float switch (brackets included) in your sump or your aquarium. When your water level gets low, the float switch reacts by turning on the pump from the fresh water container. When desired water level is reached the system will automatically shut itself off. Hobbies are suppose to be fun soooo DON'T turn a hobby into a JOB. 5 Amp Float Switch This float switch can save you from burning out expensive pumps, configured to a collection container for your skimmer or can be used for water top off. High Amperage Float Switch This float switch will operate for high water or low water level applications. To change its (on or off) setting simply removing the retaining ring and turning the barrel float upside down. This switch can handle multiple pumps with a combined amperage draw of up to 5 amps. Each switch comes with a 6ft grounded power cord and probe style switch. This float switch can save you from burning out expensive pumps, configured to a collection container for your skimmer or can be used for water top off. Hobbies are suppose to be fun soooo DON'T turn a hobby into a JOB&##xA0. In case of any damages please notify us asap so we can help you file a claim with the carrier. If you do not recieve your package please let us know we will help you track it down or locate it. No exceptions or excuses, no credit without photo. We package All products with bubble wrap and styrofoam. Any product you return must be in the same condition you received it and in the original packaging. We will not lower the value of any packages, This is against our policies. Please keep in mind sometimes there are delays during transit. PLease please have some patience. CORALVUE ELECTRONIC FLOAT SWITCH 110 FOR FRESH WATER TOP OFF SYSTEM AQUARIUM Reef Specialty Fact What is a electronic float switch and why do you need one? Reef Specialty Fact Hobbies are suppose to be fun soooo DON'T turn a hobby into a JOB 5 Amp Float Switch This float switch can save you from burning out expensive pumps, configured to a collection container for your skimmer or can be used for water top off. Reef Specialty Fact Hobbies are suppose to be fun soooo DON'T turn a hobby into a JOB. The item "CORALVUE ELECTRONIC FLOAT SWITCH 110 FOR R. Water TOP OFF SYSTEM AQUARIUM" is in sale since Thursday, October 6, 2016. This item is in the category "Pet Supplies\Fish & Aquariums\Filters". The seller is "reefspecialty" and is located in Frisco, Texas. This item can be shipped worldwide.